Ages ago, Jody sent me a postcard from Loosiana. 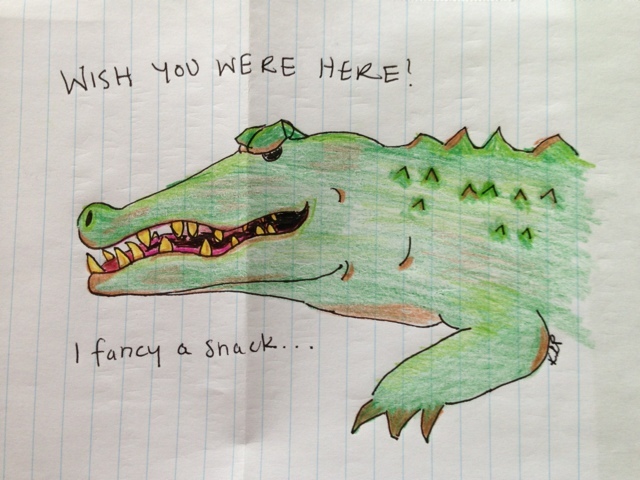 It had an alligator on it and inspired me to draw the picture below. I'm quite pleased with it, to be honest. Not too bad, even if I did need to google pictures of alligators. Also, I think it's clever of me, but SOMEbody who shall remain nameless but happens to be Australian didn't get it. He was like, "It seems like it's saying it wants to eat me." Yes, Einstein, that was the point! Jody appreciated it. That's all that matters. 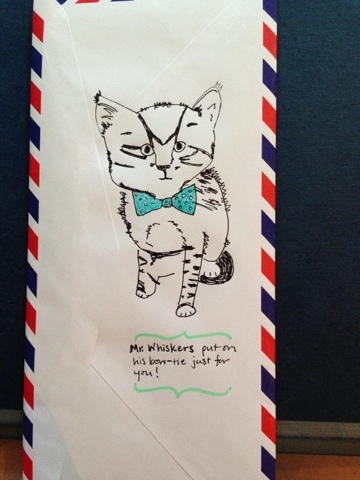 Then the other day, I wrote a letter to Jocky and decided to try decorating the envelope. There's an adorable photo on Pinterest of a kitten in a bow-tie, so I tried to copy it. The result is not displeasing, I think. When I try to find you on Pinterest, I can't...I even looked up Karenzicus (there weren't any results), and Karen Peterson (there were too many results), and Karen L Peterson (no results again). Link me! I love that cat picture! I was going to blog about it myself! Nice drawrings. Speaking of cats, our two little kitties turned seven years old yesterday. We didn't give them cake, but I did sing to those two little dummies.